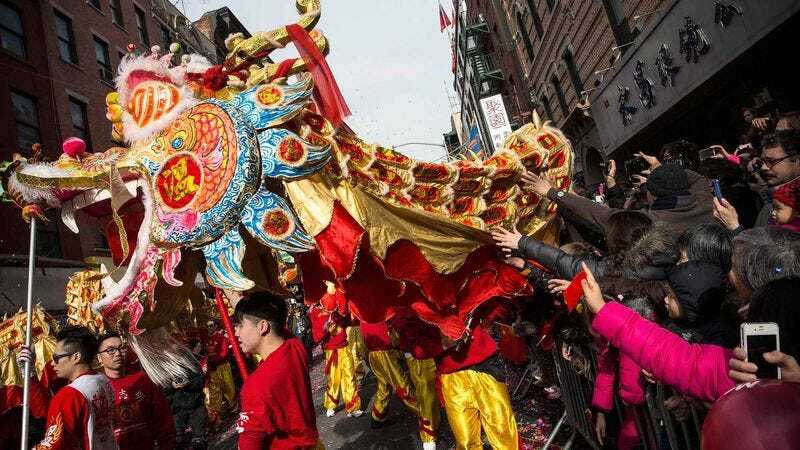 LOS ANGELES—Weaving through the crowd while occasionally pausing to hide behind gongs and elaborate bamboo fans, every single person involved in the Chinese parade currently winding down Broadway is attempting to avoid one or more pursuers, reports confirmed Tuesday. With 22 percent of participants disguised as acrobats or traditional robed warriors, 16 percent wearing large conical paddy hats to conceal their eyes, and a further 38 percent hidden inside dragon dance costumes, the chaotic procession has reportedly stymied hundreds of assassins, government agents, and private detectives elbowing their way past spectators and craning their necks in search of their targets. According to sources, the throngs of fleeing individuals would already have been killed for ransom money, wrongfully arrested, or forced to surrender a priceless stolen artifact if they had not opened a decorative silk parasol to obscure their face at exactly the right moment or thought to use a string of paper lanterns as a makeshift zip line. At press time, a sudden burst of confetti and firecracker explosions had reportedly provided the distraction the entire parade needed to scramble up some scaffolding and onto the rooftops.